Iams ProActive Health New Zealand Lamb & Chicken cat food is a complete and balanced maintenance cat food for adult cats over 1 years of age. It contains only the best fibre source which promotes a healthy gut and small stool volume, while helping to maintain urinary tract health. Other benefits include helping to maintain a healthy skin and coat as it contains a balance of Omega-6 to Omega-3 fatty acids. Dried Chicken And Turkey (37%, A Natural Source Of Taurine), Maize, Wheat, Animal Fat, Lamb, (4.1%), Rice, Dried Beet Pulp (1.9%), Hydrolysed Animal Proteins, Dried Whole Egg, Fructooligosaccharides (0.66%), Potassium Chloride, Brewer's Dried Yeast, Calcium Carbonate, Fish Oil. Vitamin A (82755 Iu/Kg), Vitamin D (6741 Iu/Kg), Vitamin E (145 Mg/Kg), Trace Elements Contain Cupric Sulphate Pentahydrate (38 Mg/Kg), Zinc Oxide (229 Mg/Kg,) Manganous Sulphate Monohydrate (138 Mg/Kg), Potassium Iodide (1.6 Mg/Kg), Basic Cobaltous Carbonate Monhydrate (5.2 Mg/Kg). 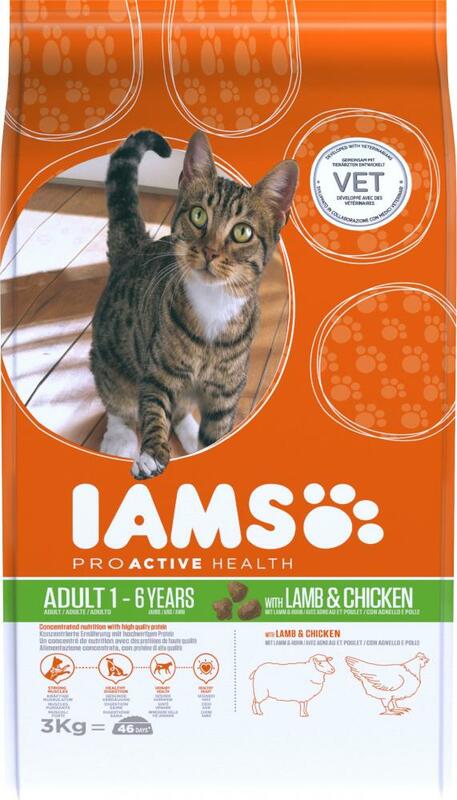 There are currently no questions for Iams Proactive Health Adult Lamb & Chicken Cat Food - be the first to ask one!